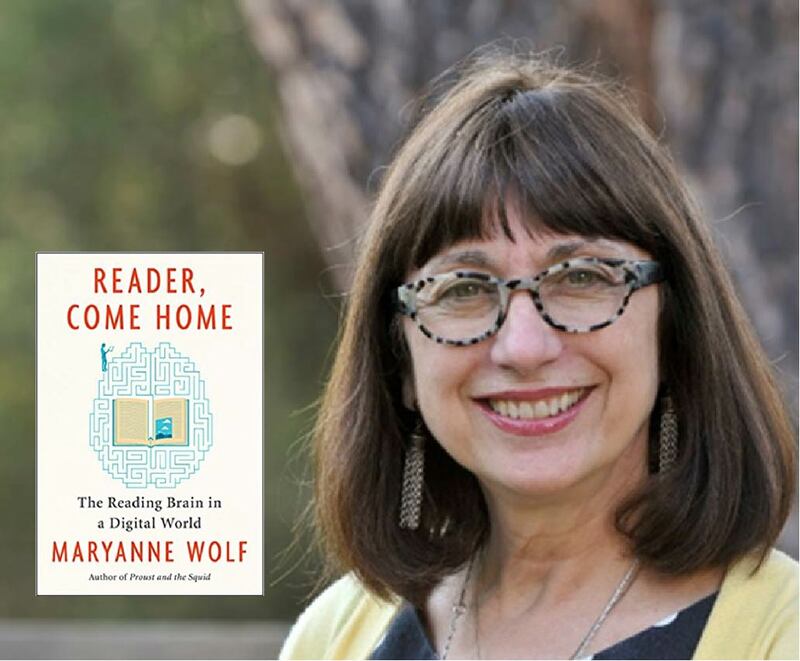 We recently caught up with Dr. Maryanne Wolf about her book Reader Come Home, which discusses the challenges of being a reader in the Digital Age. This is the second in a series of interviews with Dr. Wolfe. The first interview was around her book Proust and the Squid. Well, the new book is the third in a trilogy. And I had a chance to talk with you a little bit in our last interview about how I look at the whole of my work in the last 10 years as a kind of an arc. That's an arc that began with my worries and my questions with the book Proust and the Squid: The Story and Science of the Reading Brain. My question then was, What has reading become? The second book, Tales of Literacy, was an Oxford monograph, a research book that allowed me to do all kinds of research about the question, What has reading become in a digital world? And with that research as the foundation, I began to really tackle what I consider the very big question society must now confront. It's no longer what will happen but, What is happening to both our children and ourselves as adult readers in terms of how reading has changed and is changing? This new book becomes the third in this trilogy and opens a new set of questions. The book becomes my first developmental proposal for looking at how in the future we can go about creating a brain that is capable of deep reading yet preserves both the best characteristics of print reading and the best aspects of digital reading. So, the hope is that this book both confronts what I consider a cautionary tale that's going on and a potential beginning of a response to what should happen next. It was an opportunity to do two things: to say what we must preserve to remain the good readers we have been, and how to make the best readers of the next generation. One of the ideas that comes across very clearly from your book is that without deep reading, we aren't exposed to empathy. So, does a lack of deep reading mean that our culture has a potential to become less empathetic or do we not jump to that conclusion? For the last century people have used deep reading to be exposed not only to people who are very different from them, but to people in different historical epochs, people who have very different viewpoints, people who one would ordinarily consider foreign or other and therefore potentially sinister. These are made real to us. I’m reminded of the interview between Barack Obama and Marilynne Robinson, the great novelist, whom Obama referred to as an ambassador of empathy. He discusses how the novel introduced him to others and to a view that was never going to be black and white, but full of the grace of who others are. Robinson, in response to this, said that she believes the greatest threat to democracy was what would happen when we consider the other as sinister. And I believe that reading at its best, deep reading, inspires us to go beyond ourselves and the confines of our narrow lives. It allows us to really encounter others whom we might have even thought of as enemy because they are so different from us. And so, I very much worry when we have a mode of reading that does not allow sufficient time or motivation to leave the confines of the familiar, to really think about transcending ourselves, because it takes time. Empathy takes time. If we lose that, I truly believe we will endanger the kind of democratic society whose base is the listening and the recognition of multiple voices and viewpoints. That's what a democracy does. And reading at its essence gives us the chance to experience those voices, those others in ways that are often unavailable to us in our lives. Literacy is not about just decoding. Literacy is about understanding our world at ever-deeper levels. And just as Alberto Manguel uses the term geometric progression—everything that we build upon, we have read, offers a foundation for what we will be next. And I believe that geometric progression is as much about understanding others and their viewpoints, which is absolutely necessary for a civil society. Jane Smiley—I quote her in the book—says that she doesn't believe the novel will be dead but that it will be sidelined, leaving us with leaders who never ever encountered or experienced what others feel like. And I think she ended that quotation by saying that if we have leaders who do not read, it is tantamount to inviting barbarism to reign. I'm not making a political statement, I'm making a statement for humanity. And to have leaders who do not read, who do not understand others, who live within the narrow confines of their particular realities, is a very dangerous kind of world. Why did you choose the letter-writing format for the book? After I wrote Tales of Literacy, which is a very research-directed book, I had been asked to consider writing another book. And I remembered something that I had not ever thought about for a long time, and it was my hope years ago to write a book called Letters to the Good Reader. The whole idea had been originally inspired by Rilke's book, Letters to the Young Poet. I reread Rilke, and I realized that what he was doing was extending the relationship between the author and the reader he would never know. I thought, “What better way of trying to form a dialogue with the reader than to try to write letters?” What a wonderful thing if the letter could be neutral, not saying "I'm the expert, here is what you should think," but rather, "Here is my knowledge base. Where is yours? How can we connect them?" At the same time, I reread another book that wasn't about letters but was something very important to me: Calvino's Six Essays for the Next Millennium. He wrote about the important characteristics of writing, one of which was lightness and clarity. I realized that the letter can help me give some lightness to very difficult topics. As you’ve written elsewhere, humans were not meant to read. We're not wired for it. So why did it happen and how did it happen? It's still kind of a human mystery. We know even to this moment that there are mysteries about the very origins. For example, we've always thought the origins of writing came from the Sumerians, but even that is disputed because it could have been that the Sumerians were not just giving the Egyptians the idea, but the Egyptians might have given the Sumerians. So, there are these little mysteries still in history about who was the first. And if we want to go back further, there are caves where there are rocks with markings that are clearly meant to depict or symbolize something. Some of those markings go back probably 80,000 years ago. In Proust and the Squid, I said the first letters were numbers depicting how many sheep or how many goats or how many vessels of wine. There was a financial motive from the start. What happened to cause those first Sumerian or Egyptian characters beyond recording of things that were about commerce, I think a lot of it began because of religious reasons, how we were memorializing our prayers, our sense of wonder. I see written language as the second order of that same drive that exists within all of language that drives us to express the deepest origins of our wonder and the highest forms of expression of our thoughts even knowing we can never fully do it. Can you talk about ways in which reading is changing? Well, I believe that we are in the middle of understanding it, but we do not understand it fully. What my worry is not so much about the fact that we can read something on a Kindle and listen to it the next day. But what I want to be sure is that whatever medium we use allows us to become immersed in the material to be able to allocate time to real reflection, to be able to match the mode of reading with the purposes that we have and not to believe that each mode is created equal. They are different. Audio is different from a visual form. A Kindle is different from internet reading. Both are different, and I am very concerned that people who are reading on screen are not necessarily able to have the kind of recursive aspect that helps comprehension. Audio has the same issue if you will because the audio version, though you can go back, you don't. Same thing with the Kindle, though you can go back, you don't. And so, we lose a lot of detail without recursive capacity. We don't even understand that we are using the recursive element as much as we are but especially children much more than adults are using it. So, the question is, what is the purpose that you have for reading, and which is optimal for you as an individual? Now, for my son, Ben, who is dyslexic, there is no question the audio version is so much preferable. I am so happy that he's able to read my book with his ears. And I really believe that a lot of people have benefited completely and for some people, I think the audio is just simply preferable. For others, I believe that the kinesthetic recursive element, the flowing down by nature of the thing itself is preferable, but in a world in which we are all taxed for time and where we really don't have enough time to do all the things we do, thank God we have the Kindle version. So, to the extent that one can be really thinking and reflective when that's the purpose, then that's where my concern is about mediums outside of print arise. Are we just going to be skimming away and there is no question that that's the new norm. But it will always have those four factors of the individual, the circumstances, the purpose, the genre and, the mode. The newest meta-analysis of all the studies today comparing same material in print to the same material in digital, print is superior to screen. Deep reading is connecting the information that one decodes with the most sophisticated cognitive and affective processes that we human beings have. So, it begins with connecting the text with our background knowledge and making analogies. From those analogies, we form the basis of what we can use for our inferential or deductive types of processing. I call them the scientific method processes. This set of connections is happening simultaneously. It's not linear. And then out of that stuff comes a critical analysis of whatever was read. You're getting input that’s automatically activating not just sensorial and perceptual processing but also affective ones. The affective ones are so essential to leaving ourselves and passing over into the perspective of others. That is the basis for empathy. So, you're bringing all this information into reading. All this cognitive and affective information, you're bringing these together and that becomes the basis for understanding, and understanding from this one reader's perspective can sometimes, but not always, become the basis for great insight that's very personal and rarest of all become the basis for insights for others. If there is any miracle, it's the unbelievable ability to put all these processes together in this network that we call the reading brain circuit. Who could imagine? What an amazing feat! And everything that you just described is independent of digital or print. Absolutely. I am not talking about the print as separate. I'm talking about what reading in any medium can ultimately do. The affordances of some mediums are better than others for allocating time to deep reading. It's not that it's impossible. Do we need guidelines for reading in this digital age? Yes, we do. I believe we need explicit teaching of deep reading. First in print, and after it's firmly established, how do we do this now on screen, which encourages us to read in haste? Now, tell us about your new center at UCLA. It’s the Center for Dyslexia, Diverse Learners, and Social Justice within the Graduate School of Education and Information Studies. And it was the brainchild of a group of people and the dean, Marcelo Suárez-Orozco, at the grad school to pull together our best research with our schools. It's an experimental effort for me particularly to be the architect or the creator of a group of resources around two major sets of questions. The first question is, how can we use our understanding of the reading brain and what goes on in dyslexia to help all readers across all ages, across all backgrounds and even countries? How can we use this information? And I believe that neuroscience and the studies of the reading brain is one of our absolute best sources of knowledge for what goes on in the development of reading anywhere. So, that's question number one. Question number two is, whether, we can find new ways of connecting our multiple resources that will allow cutting edge research to be in the hands of educators much more quickly, much more efficiently and at the same time be able to be within a process that is a reciprocal relationship between researcher and educators in schools. So that in the past so often, I think great mistakes have been made by the assumption that all you must do is just give the research to the teacher and all will be well. That is really doesn't work. I want this center to be a totally interactive force as well so that we are constantly bringing researchers and educators together and that the educators are saying what they can use, what they can't use, what they need. And so that there's this constant going back and forth of resources between two entities, researchers and educators. It's a real effort to establish the reciprocal relationship between research and education.